In 2016, we launched an initiative to take our extraordinary nanosicence workshops to malls across Los Angeles. Help us get engaged with the community to bring science to a mall near you! Jia Chen, former education director at the California NanoSystems Institute at UCLA, explains to a crowd of bystanders at the Promenade mall that atoms, while very small, can form large objects in a variety of shapes. Graduate student Pascal Krotee pours out a solution to demonstrate how water can be purified by using a filter made from nanomaterials. 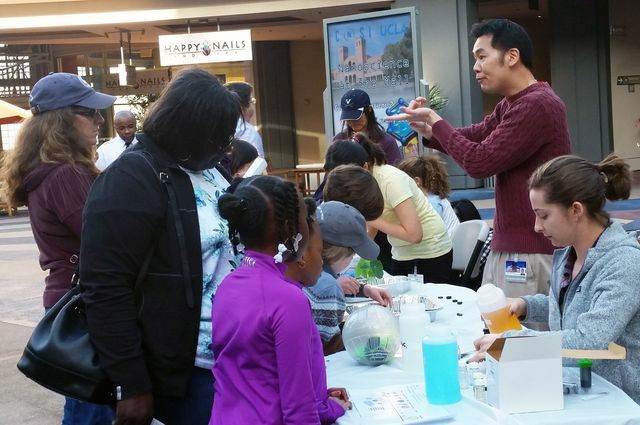 In 2016, we launched an initiative to take our extraordinary nanoscience workshop demonstrations to malls across Los Angeles with a program called Nanoscience at the Mall, an effort to directly engage our local community to explore nanoscience. With the help of our enthusiastic faculty, staff, graduate students, and post-doctoral scholars, we visit different malls throughout the year and host kiosks where we exhibit novel nanoscience phenomena in a way that is easily accessible to people of all ages. Nanoscience at the Mall, funded by the American Physical Society, was an idea that came to Jia Chen and his colleague Sarah Tolbert, professor and faculty director of CNSI outreach, after they found out that the average American visits a shopping mall for four hours weekly. That’s enough time, they figured, to engage shoppers in a fun conversation about nanoscience, the study of materials on an atomic or molecular scale. Just the experience of meeting a genuine nanoscientist in a neighborhood shopping mall helps make this science seem less remote and less esoteric. “People aren’t expecting to encounter UCLA nanoscientists at the mall,” Chen said. Offering the public a convenient new venue where they can talk to a working scientist and recognize how science is relevant to their personal lives is a prime goal of the program, Chen explained. The Nanoscience Workshop for Teachers program is driven by the contribution of graduate students and postdoctoral scholars whose participation is made possible with the support of NSF awards: Material Creation Training Program IGERT, Clean Energy for Green Industry IGERT, and CHE-1112569. Gifts to CNSI’s educational programs help support outreach efforts, learning and training opportunities for future scientists and researchers.